Spotify has announced that a brand new Wear OS app for Android wearables will be coming in the next week, finally sorting out some of the control woes the music streaming service has on techy wristwatches. Until now, Spotify has been lingering on with a last-gen Android Wear app, leading users to rely on third-party controllers to fill the gaps that Spotify's own wearable software hadn't filled. However, the new Wear OS app should deliver improved controls for music playback and browsing, making it a lot easier to scroll through your playlists. The new app works with WiFi, Bluetooth, LTE, and will support Spotify Connect, so you can now play music through connected speakers, meaning you can control your music wherever you are in your home over your wrist. Not only this, but Spotify has also announced that it's going to be partnering up with fashion brands Fossil and Michael Kors to bring the new app to their smartwatches. 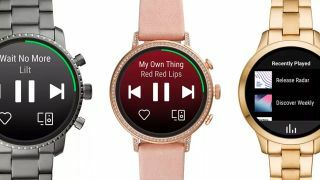 The Wear OS app will be preinstalled on Fossil Gen 4 and Michael Kors Access Runway smartwatches from November onwards, marking the latest mash up of music and fashion. If you don't have one of these fashion-leaning watches, you can still download the new Wear OS app on Google Play for whichever compatible smartwatch you have.